When I started actually looking at Kickstarter for the first time, there were a ton of things to look through. I remember there being some 700 comic, film, and game projects (each!). 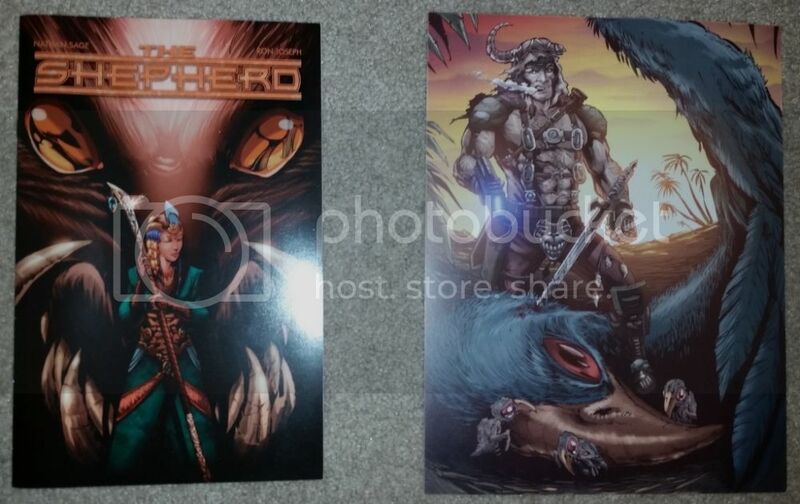 I gravitated toward this comic book, The Shepherd, because it was a single comic book that told a complete story, had wonderful artwork, and was only $10.00. The story was simple, but looked interesting: “Astrid, a young tribal shepherd who watches a flock of ghazals, must make some tough decisions when she comes upon a wounded Thanacht–a ferocious beast of legend thought extinct a thousand years ago. The above picture is what I got, along with a print by Joe Rubinstein. I supposedly also got got a 10 page digital comic prologue, but since I don’t own a single digital comic, I never picked that up. You can find the original Kickstarter here, but I never saw anything about buying digital versions in the future for those interested.